Kisoji refers to the section of the old trade route, Nakasendo, that passes through the Kiso region. Extending from the eastern extremity of Mino plain (the area marking the former Mino province). It is about 90 km in length and enters the alpine area, Kiso-sanmyaku (Kiso mountain range), as it winds along the west of the mountain range crossing several major mountain passes and eventually reaching the northern end of Kiso-sanmyaku. During autumn tourists flock to Kisoji for kouyo season, to see the leaves as they change colours. To complete this distance takes up to 3 days depending on one’s fitness level and experience. Experienced riders who can comfortably cover more than 100km a day in mountainous terrain should be able to complete it in one day whereas intermediate riders would take around 2 days thus completing 50 km a day. Non-cyclist (NC) was my riding companion along Kisoji. Although she is a competitive sports enthusiast, she is not accustomed to long distance rides so my initial plan was to ride the entire length of Kisoji in three days. The first draft plan started from Nakatsugawa Station to Tsumago via Magome with an overnight stay in Tsumago. Both Tsumago and Magome are famous post towns on Nakasendo. The following day I planned that we cycle upwards along Kiso River across Torii pass, the highest pass in Kisoji, to get to my favorite post town, Narai. The last leg from Narai would have been an easy downhill ride towards Shiojiri for a few hours enabling us to catch an express train back to Tokyo in the afternoon. However, accommodation in Tsumago was fully booked because it was a national holiday on the weekend of the 23rd and 24th of November, in kouyo season (autumn leaves appreciation season) so I had to find an alternative. The last option I came across was a pricey ryokan (Japanese style inn) in Kiso-fukushima that meant we had to complete the Kisoji ride in two days. 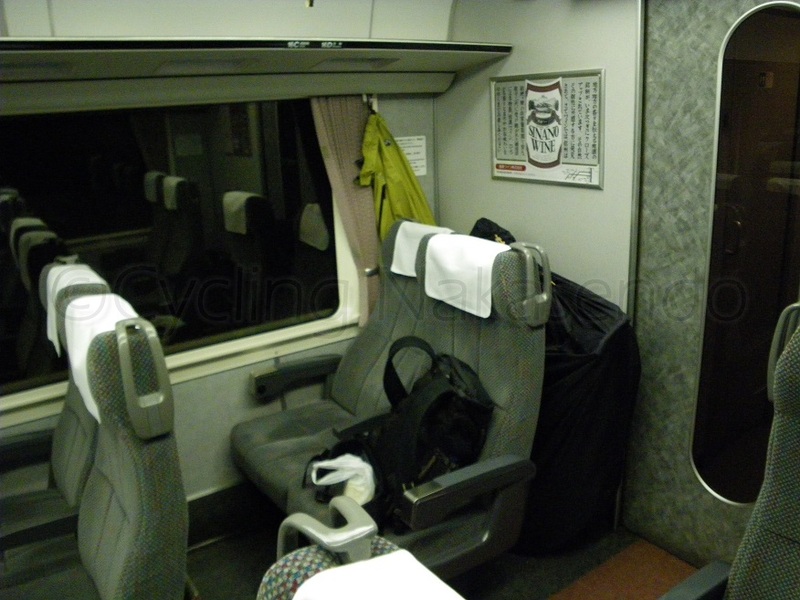 To maximize the time we could spend riding over the two days, we arranged to meet in Nagoya on Friday night, stay there overnight and take an early train to our starting point, Nakatsugawa on Saturday morning. NC used my mountain bike. While in the past I have carried two bikes at once by myself on public transport, it was super tough so I decided to send one of my bikes to the hotel where we were staying in Nagoya in advance. A special courier service for bikes is available if the bike is disassembled and packed in a special bike carrying bag called rinko-bukuro (bike carrying bag). However, it takes more days than the regular delivery service. As there wasn’t enough time to ensure it would arrive in time for the ride, I opted to carry the mountain bike with me for NC. I decided to ride my folding bike, Birdy, the only bike I have which can be sent through the normal postal service. I also had a desire to take an overnight ferry from Kyushu, the most southwesterly of Japan’s four main islands, to Kobe (west of Osaka) and cycle almost 300km in 3 days to get to Nagoya, partly through Sanyodo (an ancient highway connecting Kyushu and Kyoto), Nakasendo and Minoji (a branch route that connects Nakasendo and Nagoya). But, it turned out that I didn’t have even one day to spare to take the overnight ferry. So I had to take a Shinkanasen which although being fast, punctual and convenient is the form of travel I most dislike. As it was Friday night, the carriage was filled with tired businessmen traveling back from business trips or back from where they have been sent to live for work. The weary and oppressed atmosphere they were emitting killed my romantic notions of being on a journey but I had to thank the Shinkansen. I got to Nagoya in precisely 2 hours and 36 minutes and successfully met NC at the station. She arrived almost one hour earlier from Tokyo, also by Shinkansen. We walked about 5 minutes, carrying my disassembled mountain bike to the Super Hotel near Nagoya Station, a budget business hotel chain found across the country. At around 3300 yen per person per night, even on Fridays, Super Hotel is a very good deal. Their hotels usually have onsen (hot spring) facilities, so we were expecting that the one in Nagoya would too but unfortunately it turned out it didn’t. We picked up the folding bike I sent from Kyushu at the reception and dumped all our baggage in our room, then went out for a light dinner and drink at a local izakaya (Japanese style bar).